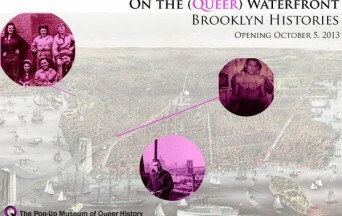 “On the (Queer) Waterfront: Brooklyn Histories” kicked off this weekend, a unique and collaborative art and performance show curated by The Pop-Up Museum Of Queer History. A multifaceted intersection of history lab, art space and teach-in workshops, the show sought to provide visibility, education and celebration surrounding queer identity in Brooklyn, N.Y.
We caught up with Hugh Ryan, Founding Director of the Pop-Up Museum of Queer History, to discuss the show’s Oct. 5 kick-off, the history of the Pop-Up Museum Of Queer History, and Brooklyn’s legacy of queer identity. Posted October 9th, 2013 & filed under Interviews.